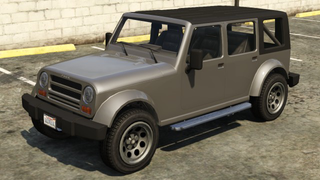 (Welcome to GTA Oppo Car Review, where each review will go in-depth with a car in GTA V/Online. Scores will be based on a similar formula to Jalopnik reviews, with a score out of 100 based on 10 categories: Exterior, Interior, Acceleration, Braking, Ride, Handling, Gearbox, Toys, Audio, and Value. The Canis Mesa is a pretty straight forward sort of vehicle. It's built to be capable on and off road, without the technical sophistication found in a Gallivanter product. Simple American ingenuity went into this machine, but is it worth the sticker price? The body of the Mesa isn't meant to turn heads of those looking for beauty in an automobile. The styling harkens back to the military utility vehicles of World War II, with a modern touch and modern manufacturing. Canis actually fits out the Mesa's interior pretty decently, with a leather wrapped steering wheel, leather seats, and a good amount of room both in the second row and behind it, where there's ample cargo room. Fold down the second row of seats, and that space nearly doubles, making it a pretty good vehicle to go fishing or hunting with. Unfortunately, fit and finish of the dashboard isn't very luxurious, with hard plastics throughout, but this is a pure bred utility vehicle. The V6 in the Mesa is actually rather peppy for the sort of vehicle it is and how much it weighs. The real strength is uphill acceleration, where some vehicles would falter going up a steep paved hill, the Mesa pulls it's own weight up pretty well. On the opposite end, the Mesa's braking isn't too good. It's equipped with drum brakes all around, so it will stop when you really need it to, just not very quickly. For a relatively old school tech vehicle, Canis has built it solid enough to handle daily driving comfortably. Bumps can still be felt, but you don't feel them as much as you'd expect, and of course, there's a good bit of road and wind noise, because of the removable soft top. The Mesa takes turns a bit wide, and the steering isn't sharp. The vehicle also has a wide turning radius. Still, the steering is responsive, albeit not quickly responsive. It's not great, but it's adequate. Just like the engine, the transmission is pretty darn good. A smooth shifting 6-speed manual transmission that has quick gear changes, and each gear has a good rev range. No power windows, no power locks. It comes equipped with an AM/FM/CD stereo and AC. Lately, Schyster Corporation products have been praised for well above average stereo quality. We couldn't agree more. With a solid engine note and side exit exhaust, the Mesa sounds pretty good without the radio on, too. Our Mesa tester was priced at $30,000. Not bad for what you get, and the nostalgia that comes with it. But, for the same or less money, you can get even better. 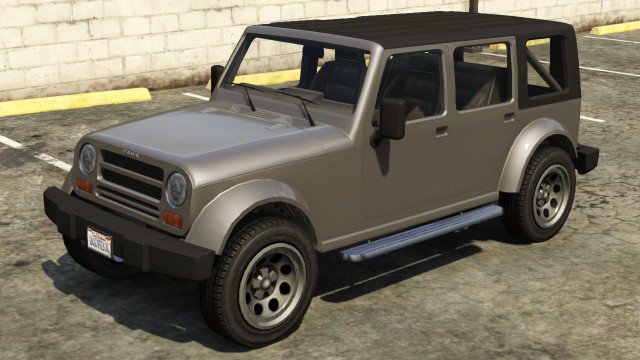 For example, for $2,000 more, you can get a much better equipped Vapid Radius, which also has good off-road capability, although not as capable as the Mesa. For the same price as the Mesa, Canis also offers the Seminole, which has a good reputation off-road as well. There's also two alternatives that are priced lower, too. Bravado's Gresley is $29,000, and is larger. For $27,000, there's the equally nostalgic and highly rugged Karin BeeJay XL.